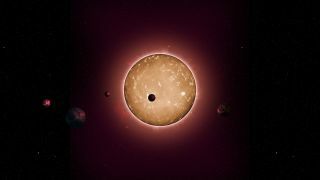 Artist's illustration of the Kepler-444 planetary system and its red dwarf star. There may be far fewer potentially life-supporting alien planets out there than scientists had thought. Many Earth-like exoplanets that orbit red dwarf stars in the "habitable zone" — the range of distances at which it's thought that liquid water can exist — are actually too hot to host life, a new study suggests. Red dwarfs (also known as M dwarfs) are smaller and dimmer than the sun. About 75 percent of the Milky Way's 100 billion stars are red dwarfs, and many of these stars host rocky planets in the habitable zone. But M dwarfs are extremely active stars, and the conventional wisdom had held that their powerful radiation would drive off most of the planets' thick air relatively quickly, allowing surface temperatures to settle at a habitable level. But this probably doesn't happen much of the time for planets in the habitable zones of red dwarfs, Owen and his colleagues found. The researchers' computer simulations suggest that worlds at least as massive as Earth have enough gravitational strength to hang onto the majority of their atmospheres. A runaway greenhouse effect therefore likely takes hold on such worlds, rendering them uninhabitable for the long haul, study team members said. But there is some good news for people who hope that life is widespread throughout the Milky Way and the universe. The modeling work suggests better prospects for smaller planets — worlds about the size of Mars, which is 11 percent as massive as Earth. Such worlds located in red dwarfs' habitable zones probably cannot hold onto their air and therefore may be temperate enough for life to emerge, the study found. "There are hints from recent exoplanet discoveries that relatively puny planets may be even more common around red dwarfs than Earth-mass or larger ones, in which case there may indeed be a bonanza of potentially habitable planets whirling around these cool, red stars," study co-author Subhanjoy Mohanty, of Imperial College London, said in the same statement. The new study was published today (May 25) in the journal Monthly Notices of the Royal Astronomical Society.